Life of a Paleo College Student (now at Paleototherescue.com) | A collection of thoughts, recipes & ideas about my paleo lifestyle while away at college. So I’ve had to take a bit of a hiatus from recipe creating while in the process of ridding my gut of a parasite (can read more about that here) / healing my gut before and after. There’s only so much one can do with 4-5 different types of vegetables, coconut oil, & a handful of spices. Now I’m not saying I haven’t been able to create some very delicious meals using these limited ingredients, but I’ve been keeping my meals simple & somewhat controlled so that I can get a good handle on any symptoms that may arise from the different medications/supplements I’ve been including in my plan for getting rid of my parasite (B.hominis). 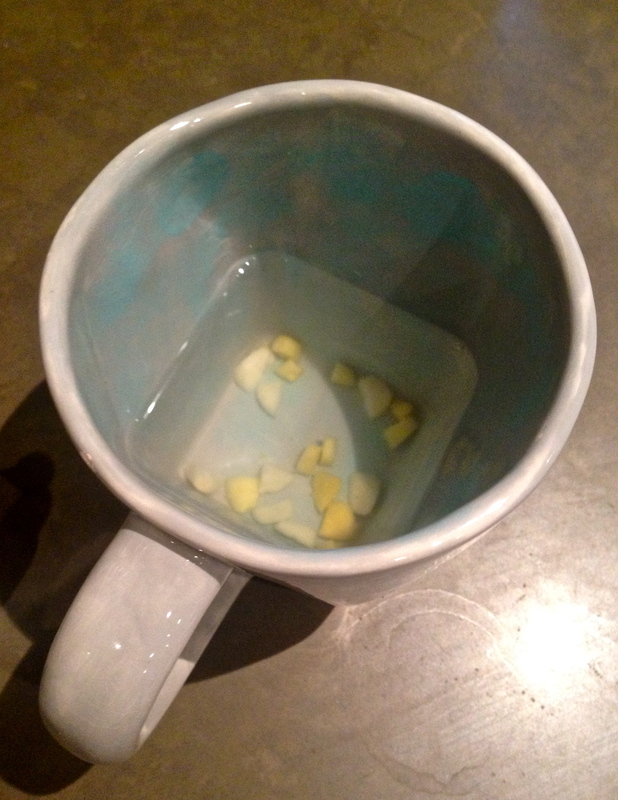 With that being said, I’m officially done with my antibiotic, have successfully administered three self coffee enemas, and have begun taking the herbal Paragone supplement – and am ready to begin experimenting with adding new foods & creating new recipes again! 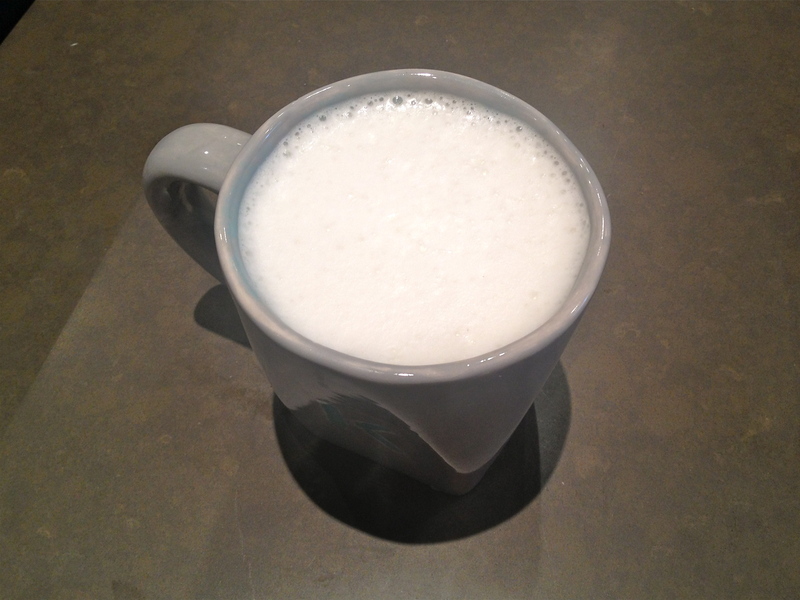 A little ironic that the first recipe I choose to post is one that I have yet to actually taste myself. 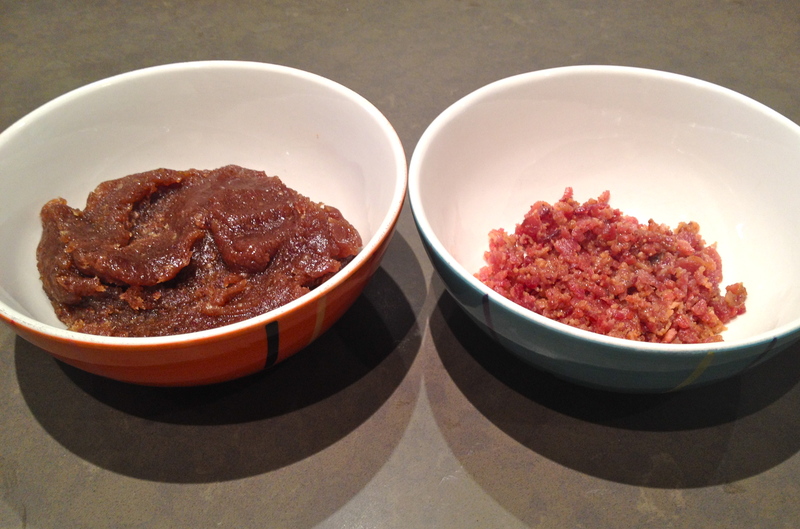 While I happily tasted (and re-fell in love with) the bacon half of the recipe, I’m planning on sticking with a no sugar diet for the time being in order to rebalance my gut bacteria, so no date tasting or full bacon-date combo for me. 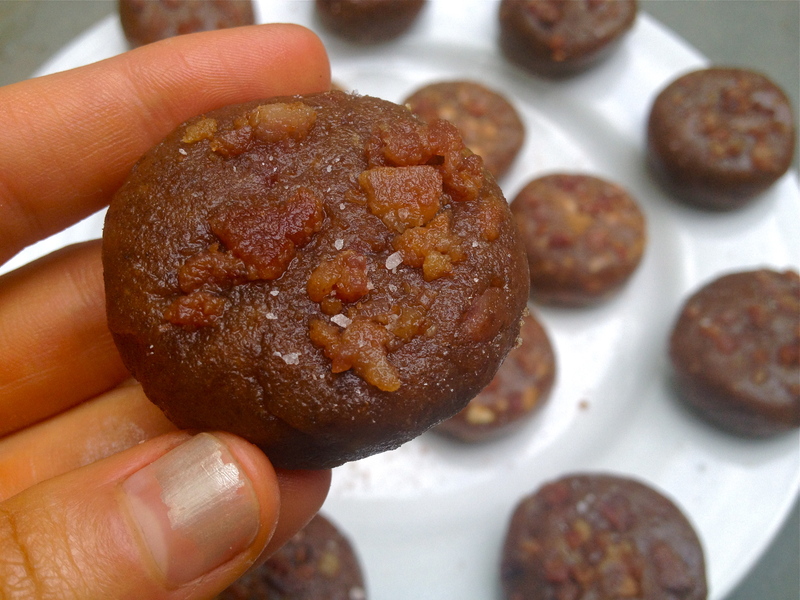 Buuut I do have the approval of both those with paleo-accustomed taste buds & those not so accustomed to less-sweet goodies to vouch that this recipe is the BOMB. 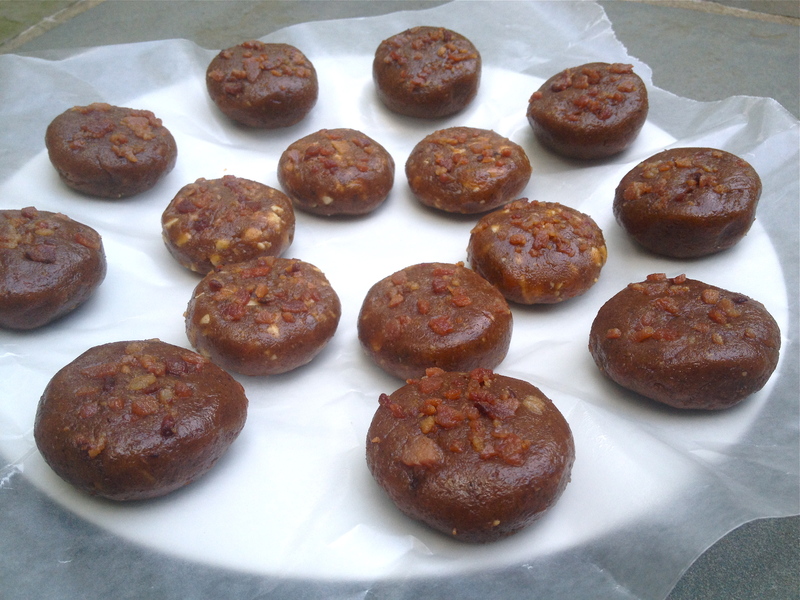 I’m excited for the day when sugar enters my diet once again, because these will be first on the list of recipes I make. 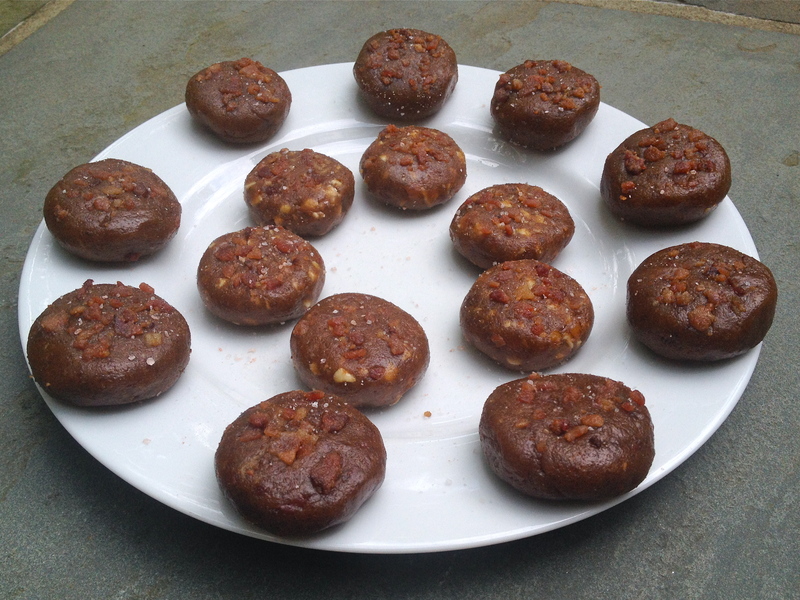 I made these bites as part of a dessert for a BBQ we had at our house last week, but I also think they would serve the purpose of a pre or post workout fuel as well & plan to bring them to my CrossFit gym next weekend as a post – Saturday morning WOD treat. So this is going to be a pretty short post. I didn’t really change much during weeks 2 & 3 of my Specific Carbohydrate Gut Healing Protocol because I already had a lot of change/activity going on & I didn’t think that messing with my diet would be a good idea. During Week Two, I had two visitors – the first being my mother and the second being my precious little monthly gift. My mom came to Denver for a mother-daughter visit & to fly me back to Maryland for the rest of the Summer. We had a lot planned over her five day/four night visit & were constantly bouncing from one activity to the next so I thought it would be best to keep my diet consistent & stick with the meats, fats, & carrots/zucchini purees during her stay. I did however up my kombucha intake quite a bit to about a bottle a day (thanks mom!) & did make a butternut squash soup for us one night. Both of these didn’t seem to cause any problems : ) Also since my monthly gift also came for a visit during this week which contributed to its own set of GI distress/symptoms I figured I’d also let that run its path before introducing any new foods or making any other changes. During Week Three, I had a big change at the beginning of the week in the form of me traveling/moving from Denver to Maryland. I figured it would also be a good idea to give my body a couple days to adjust to the new environment/time difference & get settled in at home before changing up anything diet wise as well. During this first week back at home I’ve noticed a general improvement in my symptoms as I’ve continued to up my fat intake each day by adding more coconut oil into my pureed carrots or zucchini as well as drizzled on top of my lean meats (such as beef patties or chicken breast). I’ve found that increasing my fat helps a lot with hunger cravings & keeps me more satiated & able to go 4-5 hours in between meals. The couple of small changes I’ve made during this week have been trying out Avocado Oil (which I added to a zucchini puree), trying out Cilantro (which I added to some shredded Chicken), and experimenting with leaving some of the zucchini peel on & not removing all of the seeds prior to pureeing. All of these changes seemed to go ok. Lastly, I got multiple blood tests/stool tests taken at the beginning of the week so get confirmation that I do not have any sort of inflammatory infections or gut parasites/viruses. The tests all came back negative except for one blood test which showed a small amount of white blood cells in my gut. My doctor spoke with the GI specialists at the office who are not concerned with these results, although they do show a certain amount of inflammation in my GI tract so I’m going to keep this in mind and will do a little bit of research on it in the upcoming week. Lifestyle-wise I’ve been adding more CrossFit WOD’s back in which don’t seem to be doing any damage so far! Last week I went in for a total of 3 WOD’s – two which were more intense & one that was a little less intense & more strength-based. I plan on doing this again during Week 4 but will probably add in an additional less intense/strength-based WOD along with at least two days of yoga. I’ve also been practicing free-running sleep which is pretty much just going to bed when you begin to feel tired – ideally within an hour or two of the sun setting – and waking up naturally. The first couple of days I still got sleepy around the 3-4 pm point but the past couple days have felt pretty awake/energetic throughout the day. I’m hoping to get to the point where I have steady and abundant energy during all light hours & do not have those late afternoon slump/lack of energy periods. I’m going to be home through the end of August & hope to continue sticking with this free-running sleep cycle for the majority of my remaining summer vacation so I can enter the new school year well-rested, rejuvenated, and with healthy body, mind, and gut. Second, I’m going to start making tweaks to my vegetables such not peeling or de-seeding the zucchini prior to cooking/pureeing, eating both carrots and zucchini cooked but not pureed, and adding in one or two new foods – either spinach, green beans, or yellow squash. So this isn’t exactly the most creative “recipe” in the world. 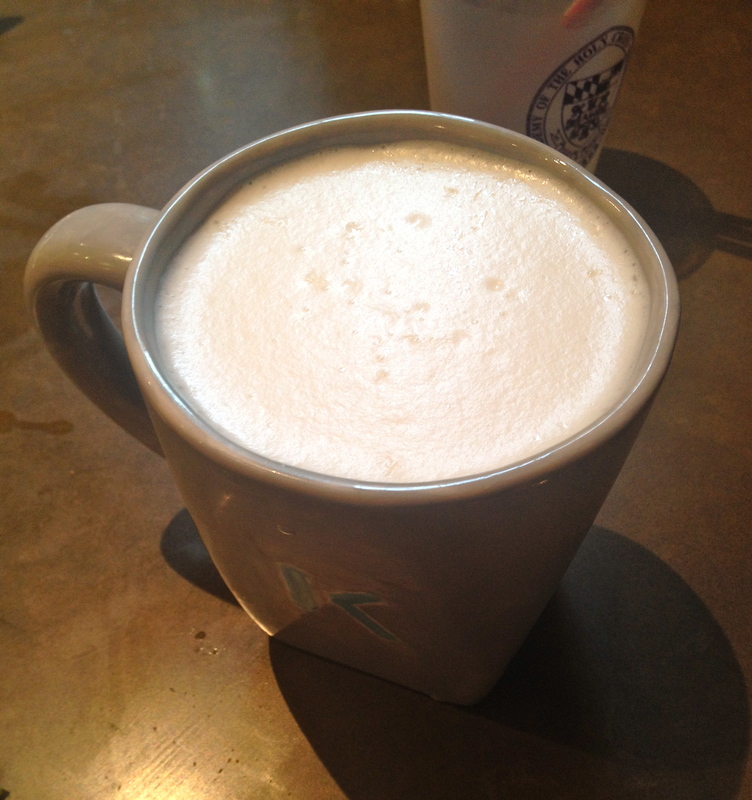 But, it’s simple and it’s delicious (hence the name). 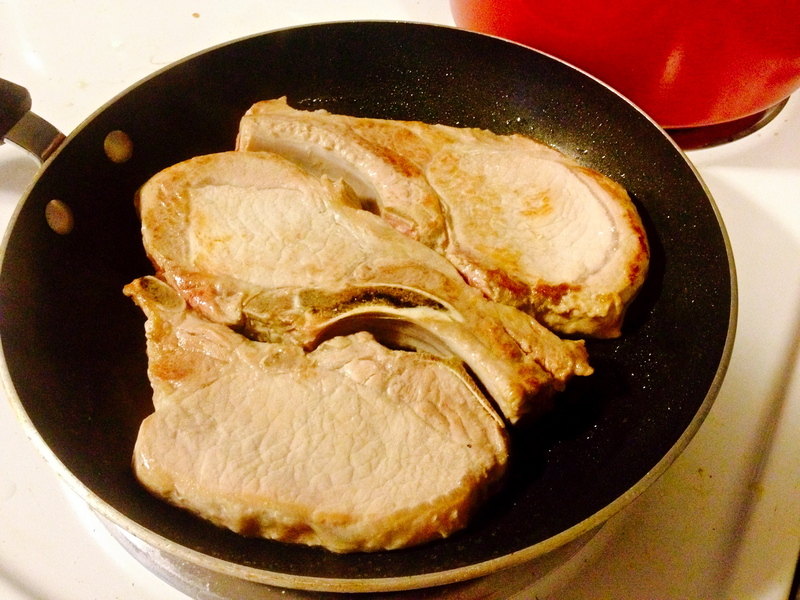 And it’s this way of cooking pork chops that converted me from someone who formerly hated pork chops, seeing them as too dry & bland, to a proud bone gnarling enthusiast. And seeing as though I’m in the midst of a real food/paleo/SCD – style gut healing protocol I don’t have a lot to work with recipe wise. So I figured I would share this one. I’ve made pork chops this way four times now over the course of two weeks and they’ve been down right delicious every single time. I declare them restaurant-worthy. They’re also super quick to make, they can be on the table within 15 minutes – so long as the pork chops are de-thawed – so they’re great to make when you want something meaty & satisfying but don’t have a lot of time to cook. And great to have in the back of your mind for when you want to impress someone who you don’t mind sucking on a bone in front of. But maybe skip it for the squeamish, “polite” guests, because bone sucking is an absolute requirement with these bad boys. Spice(s) of choice – Sage, Cinnamon, Ginger, Rosemary, etc. 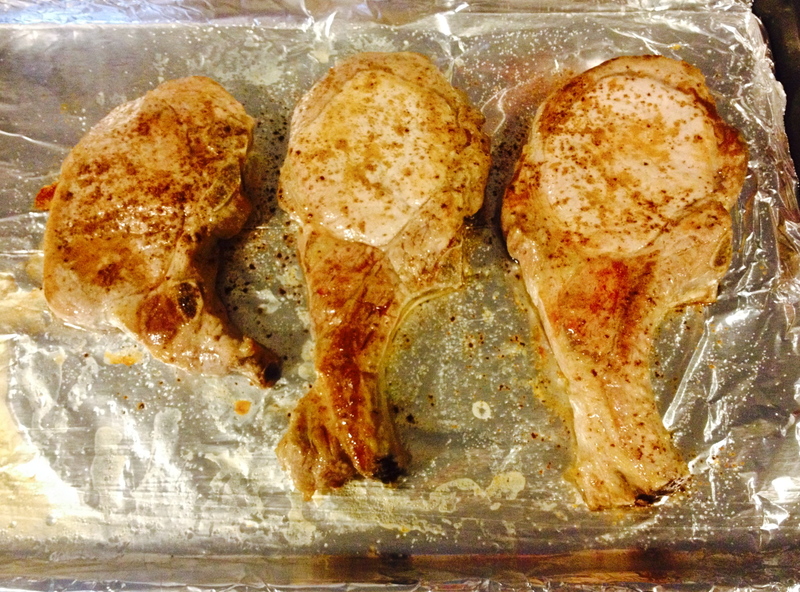 Add Pork Chops to baking sheet (can be lined with aluminum foil to help with clean up), top with a little bit of Sea Salt & put in oven for 8-10 minutes. 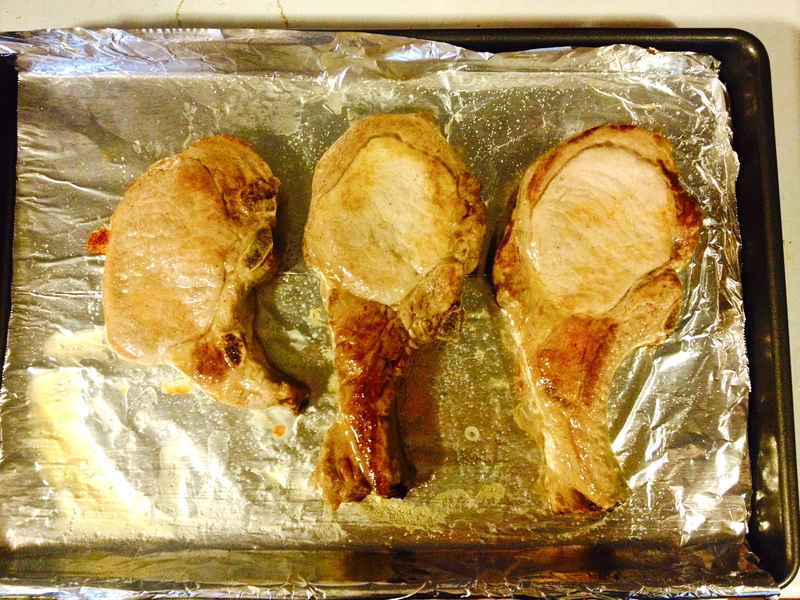 I’ve found 8 minutes to be perfect for 3-4 pork chops, but gage time depending on the amount you’re cooking. 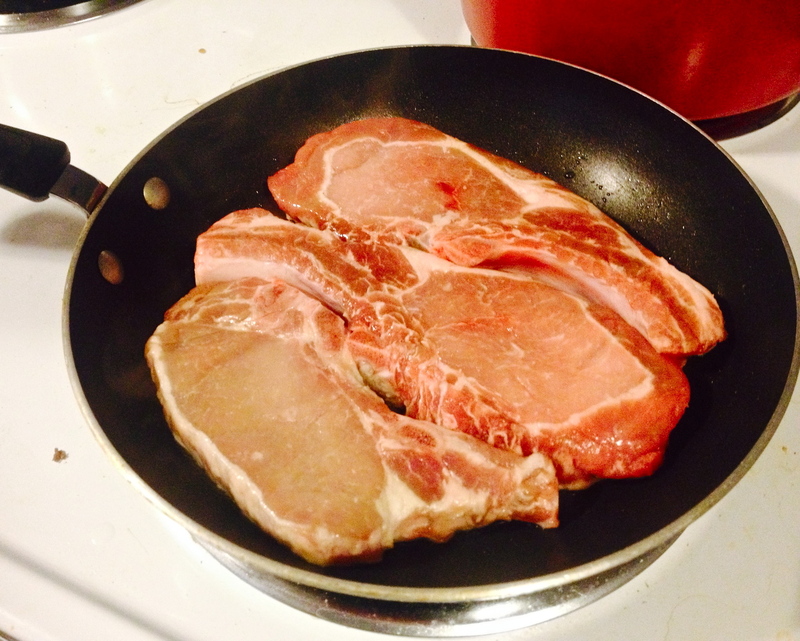 Remove Pork Chops from oven, sprinkle some additional Sea Salt on top, add spices of Choice, and Serve! The spices listed above (under ingredients) are those that I’ve found pair nicely with Pork Chops. Cinnamon + Ginger + Sea Salt, or Sage + Sea Salt have been my favorites so far.